Designed for real-life use around the home and outdoors, provides full protection for your gas grill from the forces of nature such as hail, wind, heat, cold, bugs, rain, or snow, etc. The waterproof grill cover will not rip with the reinforced stitching, bound edges and the protective water-repellent backing. There are velcro straps on grill cover's two sides. Double handles for easy fitting and removal, while the Velcro straps help fasten it around the base to protect the bbq grill cover from being blown off. Convenient side Velcro closure straps secure the grill cover around your grill. UV resistant material prevents your grill cover damage from the sunlight. Easy to wash, hose the grill cover down with water and dry it up in the sun. 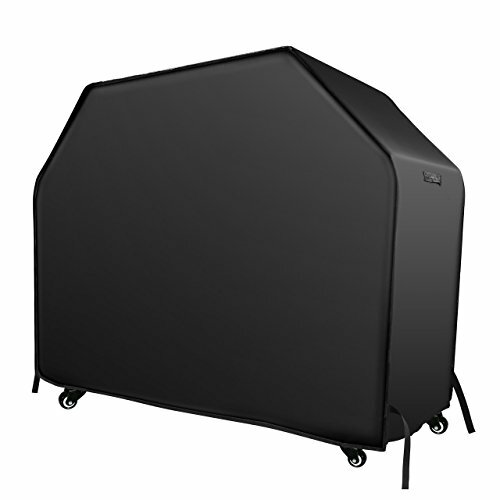 The gas grill cover is compatible with most 58 "grills. 【 WIDE COMPATIBILITY 】：Heavy-duty grill cover measures: 58 x 24 x 48 inch. Designed to fit grills with 3 to 4 burners, up to 58-inches in width.Check your grill's dimensions for proper fit. This gas grill cover fits most brand like Holland, Jenn Air, Brinkmann and Char Broil. 【 LIGHTWEIGHT & DURABLE 】：Our grill covers are made with heavy-duty PVC-lined upgraded 210D oxford material that is waterproo. Features more lightweight and thinner cover than most similar products in the market, as well as excellent durability and colorfastness. Highly resist cold cracking. 【 WIND-RESISTANT & WATERPROOF 】：Durable fabric with UV coatings shows superior water resistance, UV Protection, wind and dust resistance. Give your grill all year round protection against sun, rain, snow, wind, dust and dirt. 【 FIRMLY & EASY TO CLEAN 】：Designed with Velcro straps at two sides, this grill cover fits securely onto your grill by an extra-snug fit. Simply hose with water and the dirt will disappear soon. Dry up the grill cover in the sun for next use. 【 WARRANTY 】：Please be advised that the VicTsing product has 12 Months Warranty and 60 Days Money Back Guarantee.